Morihei Ueshiba, Osensei of Aikido. Aikido is a modern Japanese martial art, developed by Morihei Ueshiba, as a means of defending one's self without injuring an attacker. 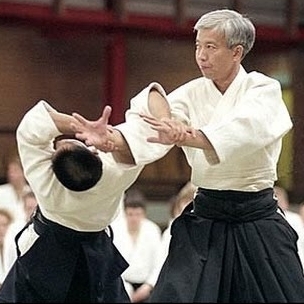 Aikido techniques generally involve irimi (entering) and tenkan (turning) movements which redirect a partner's momentum, rather than clash as an opponent. Moriteru Ueshiba (right), current Doshu of Aikido. Ueshiba is regarded as the Osensei (Great Leader) of Aikido. In 1940 he founded the Aikikai Hombu Dojo, which is now directed by his grandson, Moriteru Ueshiba, the current Doshu (Master of the Way) of Aikido. The foundation of AIKI is love. It is the embodying spirit of the heaven and earth in one’s heart, and the maintaining the great spirit of loving embrace for all, in order to fulfill one’s mission, that ought to be the way of the martial art. — Ueshiba Osensei, translated by Inakoshi Kaoru Shihan. Founded in Cardiff in 1980, Sho-Bu-Kan is a dojo which follows the traditional Aikikai school of aikido. Sho-Bu-Kan is part of the British Aikido Federation (BAF), a national club which encompasses dozens of dojos across England and Wales. The BAF is a member of the International Aikido Federation, the global organisation which exclusively represents Aikikai worldwide. Peter Gillard Shihan, chief instructor of Sho-Bu-Kan.
Fukushidoin (assistant instructor), Shidoin (instructor) and Shihan (senior instructor) are teaching ranks recognised by the Hombu Dojo. Dan grades are legitimised by the Hombu Doshu. All club instructors hold coaching certificates in alignment with the UK Coaching Council. Try and turn up about fifteen minutes before the advertised start time. This is important, as we need to make sure you're properly insured before we start the class. Bring something loose to wear. Any loose fitting clothes (e.g. shorts, shirt, tracksuit) will do. Be aware that the dojo etiquette may seem a little obscure at first. Don't worry, we're a friendly bunch and we'll guide you through it. Be ready to have fun! Everyone in our club trains because they enjoy doing so. We hope that some of this will rub off on you! Introductory Offer: any four sessions in one month for £15.00. Club membership (including insurance) costs £45.00 per year. Classes cost £4.00 per session or £30.00 per month via standing order.